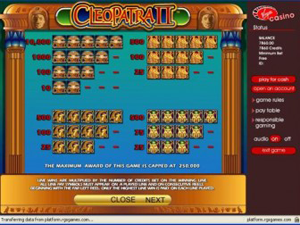 Slot games based on Cleopatra and ancient Egypt are fairly common but this game, Cleopatra II, is the sister game to the highly popular Cleopatra slots game. While the look and feel of this game is very similar to the original slots offering, there is a notable advancement in the number of bonus games on offer from Cleopatra II. The maker of this game, WagerWorks, clearly listened to feedback surrounding the first edition of the game and proceeded to implement a number of added bonus features to the game. 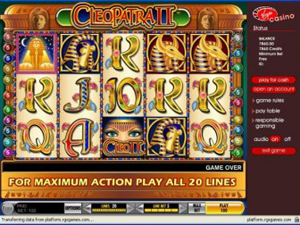 With five reels and 20 pay-lines, Cleopatra II is a step on from most traditional casino games but in the modern era, it is hardly a massive casino game. There are plenty of opportunities for players to play big on a grander scale with online slots. This means that the majority of online casino players should feel a level of comfort and confidence when it comes to playing Cleopatra II. There is certainly nothing out of the ordinary or anything that will be too confusing for most casino players. In fact, it is fair to say that this game represents a standard slots offering. The graphics are okay and fit well with the overall tone of the game but there is nothing dramatic or overly exciting about what is on offer here. If you are looking for a slots game to be visually stunning you will want more in return for your money but most players will find that Cleopatra II is able to offer up enough to keep them interested. The game features a coin value of $/£/€1 and there is a maximum number of 5 coins that can be used in the game. However, with 20 pay-lines to aim for, this means that there is a maximum value of $/£/€ 100 to aim for. This means that casino players will be able to find their own level with this game. Any player playing Cleopatra II for fun will definitely have some enjoyment but those looking to crank up the amount of money that is on offer will find that they can do so with relative ease with this game. The Wild Symbol for the game is a representation of Cleopatra II and the Scatter Symbol is a sphinx graphic. The use of the sphinx and other traditional Egyptian elements ensures that there is a level of authenticity about the game and this should be enough to keep keen Egyptian fans coming back for more. On the whole there is a chance for players of all backgrounds to enjoy what is going on here. The genuine Egyptian lovers will have a lot to enjoy with the way that the game presents itself but there is also a lot on offer for the more traditional slots players that are just looking for a good game that they can enjoy. There is no progressive jackpot available for the game, which may limit the amusement some players receive from Cleopatra II but on the whole, this is a casino slots game that will be enjoyed by many.